The wine has a fine bead and is illustriously pink with copper reflections. The nose shows dark red fruits and floral rose notes. The palate is rich with concentrated fruit weight and distinguished floral and honeyed flavors complementing a perfect balance between vinosity and freshness. 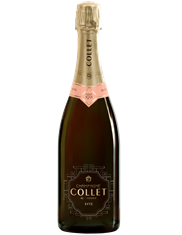 Collet Brut Rosé is perfect for all occasions. It can be enjoyed as an aperitif but also lends itself perfectly to red fruit desserts such as strawberry mille feuille and raspberry-white chocolate macaroons.